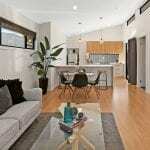 Our newest one-bedroom granny flat design, The Seaforth, is full of style! Designed with a high level of architectural sophistication and elegance, the use of timber panelling sets this granny flat design apart from the others and is a popular choice for those who have a contemporary home as their main dwelling. Simple, yet elegant, the external façade of The Seaforth holds clean lines with a parapet roof. The feature corner window provides a stunning focal point which captures your attention, while also welcoming natural light into the main living and dining areas. This particular floor plan is designed at 44m2, however, The Seaforth one-bedroom granny flat design can be scaled anywhere from 36m2 to 60m2. Its flexibility suits a wide range of backyard spaces. The internal features of this Newcastle granny flat design leave you wanting for nothing! The master bedroom hosts a built robe and lots of space for a king-sized bed. The bathroom is spacious in design, fitting in a corner shower and the laundry is cleverly built into a separate hall cupboard, leaving it inconspicuous when not in use. The galley style kitchen creates a sense of openness with its splashback window feature and it overlooking the dining and living area. The kitchen also features a stone benchtop and high quality appliances. If you have the land available in your backyard, then there is always the option to create more living space by adding a covered patio. This can further increase the comfort of the granny flat for easy indoor/outdoor living. 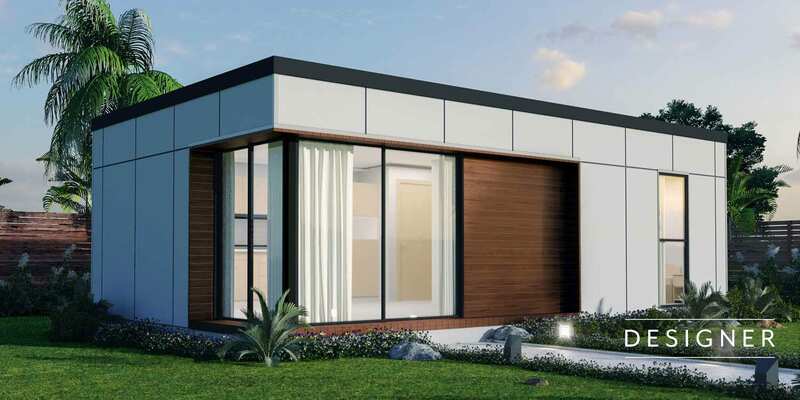 Click here to download The Seaforth designer granny flat or feel free to contact Backyard Grannys today for an obligation-free consultation by filling in the form below.